Mumbai-based Kribha Handicrafts Pvt Ltd, which runs an e-commerce marketplace for ethnic products including handicrafts under Craftsvilla, is in advance talks with existing investors -- Sequoia Capital, Nexus Venture Partners, Global Founders Capital and Lightspeed Ventures besides other VCs and hedge funds to raise $100 million (Rs 635 crore) in its Series C round of funding, a senior executive of the company said. "We plan to close the round in two to three months," Manoj Gupta, co-founder of the company said. "The existing investors want to invest more and they have pro-rata rights, so they will exercise the option," he added. Gupta declined to share details of new investors that the firm is negotiating and how much of the target sum will be pitched in by the existing investors. The company will spend the money in geographical expansion. 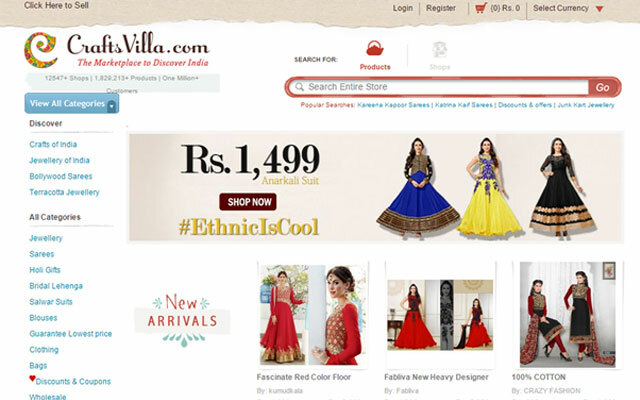 Craftsvilla currently operates in India and is launching its services in Singapore and Malaysia next month. Immediately after the proposed funding it will look at Thailand and Indonesia. Thereafter, in the next two years, it will launch its services in Philippines and Latin American countries such as Argentina and Brazil. "We plan to enter these cities and sell their local ethnic products to the local customers," Gupta said. The target is to get at least a fifth of its sales from international business, he added. The firm claims it is on an annual GMV run rate of Rs 250 crore ($40 million) currently. Craftsvilla works on an inventory less model and says that its marketplace has over 1,300 sellers. The company last raised $18 million in January, though it announced the investment last month. This investment was led by Sequoia and also saw Rocket Internet founder Samwer Brothers' Global Founders Capital and other existing investors participate. In 2012 Nexus and Lightspeed had invested Rs 8 crore ($1.3 million) in Series A round of funding after putting in Rs 2.3 crore in an early stage funding in the startup in 2011. Founded in 2011 by husband-wife duo Manoj and Monica Gupta, Craftsvilla.com e-tails products across categories, including clothing, handicrafts, jewellery and arts. It has also earmarked Rs 100 crore for marketing campaigns and has signed advertising agency Leo Burnett to create its first media campaign. Craftsvilla is looking to follow US-based Etsy, which created a successful P2P marketplace for handmade products. Etsy went public on NASDAQ last month with much fanfare but has lost one third of its value after listing over alleged counterfeits and trademark violating products sold on its platform. It still commands a market cap of around $2.2 billion. Craftsvilla.com Kribha Handicrafts Pvt. Ltd. Nexus India Capital Advisors Pvt. Ltd. Sequoia Capital India Advisors Pvt. Ltd.